For nearly three decades, Applebee's is your neighborhood grill & bar, the way it was always meant to be: food, drinks & you. 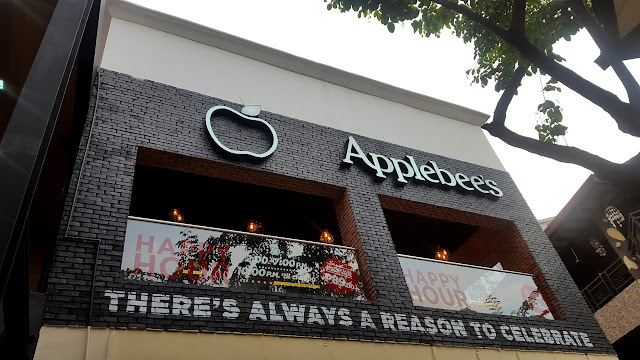 Applebee’s started with the same philosophy as they follow today: focused on serving good food to good people and also now with a brand new concept of "There's always a reason to celebrate". 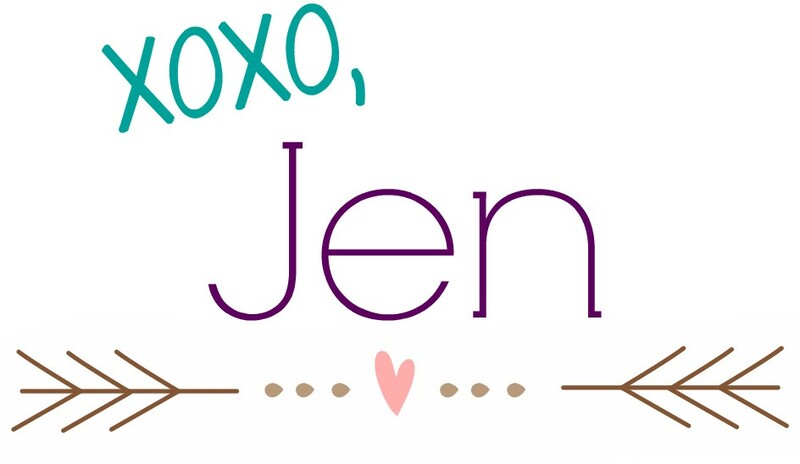 Dining out with friends and family doesn't require only commemorating very special occasions. 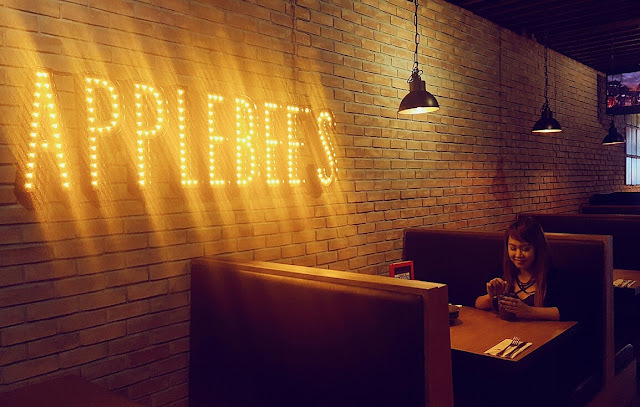 Like all the Applebee's branches around the world, the Eastwood branch exudes a super cozy, fun and family-friendly atmosphere. With mostly earth tones for the store color, the use of brick, wood and bulb lights will transport you to that complete country-yet-modern feel. I was surprised yet again about the size of this branch, because it was really huge! They have an al fresco area where you can find the bar; a hallway with couches and dimmer lights perfect for cozy/chill eating and drinking with friends and the main dining room, which is more well lit and have huge windows - perfect for families. 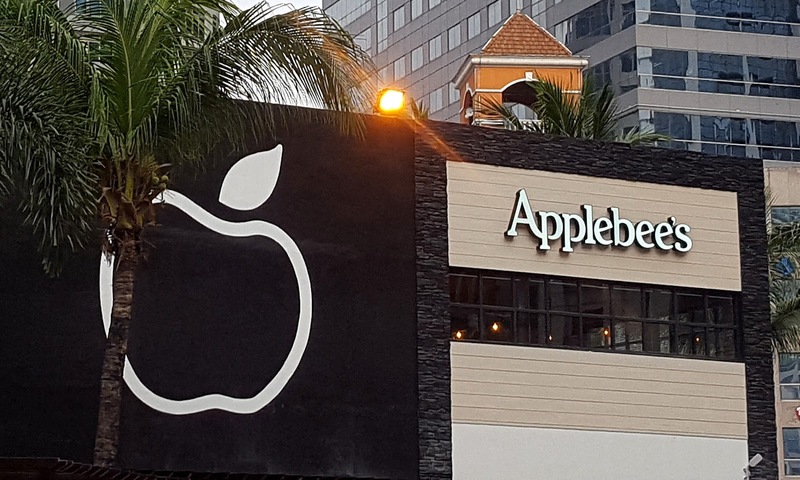 Applebee’s Philippines is giving its Filipino customers the same experience as it is the US. They have a half open kitchen where you can take a peek (if you want to) to see how your food is being prepared. The uniforms of the crew are also the same as that of those that the staff in the US wear. As with the food servings, expect big portions and superb quality. 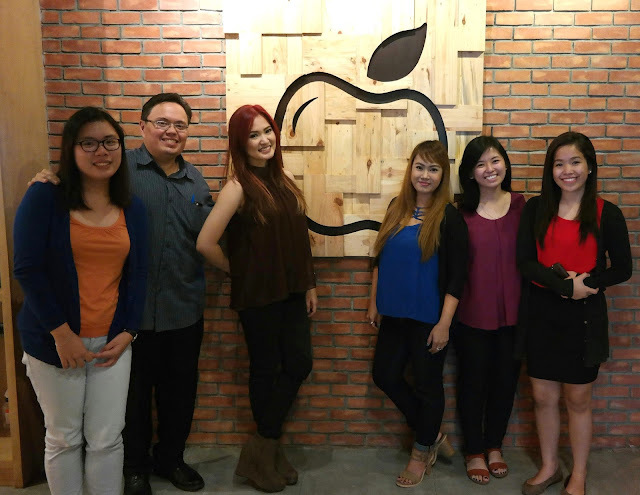 Though I've learned that they tweaked some things in their menu and ingredients to suit the Filipino palate. Sriracha Shrimp – crispy shrimp coated with rich and creamy Sriracha chili-lime dip. This is my favorite Applebee's appetizer so far! Though I am allergic to shrimp, I don't mind popping an anti-histamine or two if you're serving me this. The size of the shrimps is just right, not too small and not too big, just enough for that perfect bite. I am not a fan of spicy food, but this was tolerable and I was the one who almost finished the entire plate. I love the coating and the creamy Sriracha sauce that the shrimps were tossed in. Wonton Taco – spicy chicken-stuffed wonton shells, cole slaw and cilantro. Here's a new take to the usual tacos, using Asian flavor with wonton shells. i love how the shells stayed crispy with every bite. The chicken was also has the right spiciness that I can take so I am giving them a thumbs up! Double Crunch Bone-In Wings – double fried wings with a choice of honey BBQ, sweet and spicy, classic buffalo, or Korean BBQ sauce. We chose the classic Buffalo flavor because you can't go wrong with a classic right? A little bit on the spicy side too but very tasty and the meat was tender and cooked well. They go well with the sour cream dip too. Pork Ribs – BBQ pork ribs marinated in Applebee’s special house blend, grilled to perfection, served with corn on the cob, French fries, cole slaw, with a choice of honey BBQ sauce, Smokey chipotle, spicy sweet Asian chili and Korean BBQ sauce. Ribs, oh ribs! How can you say no to them? We ordered a full slab, half was smothered with honey BBQ sauce and the other half with Smokey chipotle - and both were super good. The meat falls off the bones, just the way we like it. Super big serving with one of the best potato fries I've ever tasted. Fiesta Lime Chicken – grille chicken done fiesta style with zesty lime sauce, Mexi-ranch and Jack-cheddar. Served with crisp tortilla strips, mexi-rice and freshly made pico de gallo. I super love this dish! The Mexi-rice was yummy and very flavorful. The grilled chicken with melted cheese on top is mind blowing! If you've got a big appetite then this is what you should get because this one serving can literally feed two persons. Quesadilla Burger – juicy burger with Applebee’s signature Mexi-ranch sauce with pico de gallo and shredded lettuce served in a unique Jack and Cheddar quesadilla. Another Applebee's item that went straight to my fave list! Every aspect of this quesadilla burger is downright awesome. We had our burger cooked with some some pink on it, which means it's medium rare and the meat juice was still there. If you don't like medium rare you can have it with no pink, your choice. The sauce dripping from the inside of the quesadilla is something to die for. This is a must try and shouldn't be missed if you visit Applebee's. 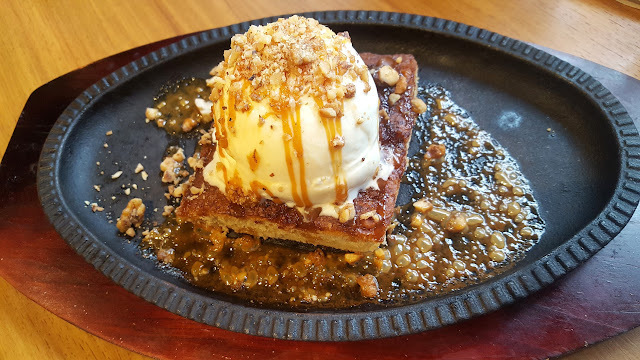 Butter Pecan Blondie – baked with nuts, topped with ice cream, glazed pecans and cream cheese sauce and served sizzling. We were so in awe of this signature dessert from Applebee's. It is sooo good that no wonder this is their best-seller. The was somewhat pleasingly firm, dry, and brittle surface but the inside was moist and soft. The nuts gave it a satisfying texture and with the ice cream it was just heaven in every bite. Though I like it as it is even without the cream cheese sauce. Another must try! Black Forest – brownie chunks, vanilla ice cream, grand Marnier cherries and strawberry jam topped with whipped cream and a Maraschino cherry, garnished with hot fudge and pecan nut brim. Mugged desserts are becoming a trend, and this is a new addition to the Applebee's desert menu. Imagine paradise put in a mason jar, that's how I can describe this dessert. Every layer is giving fulfillment beyond measure. Inside the mug are generous amounts of brownie chunks, chocolate chunks, cherries and strawberries. And yeah, see the amount of whipped cream on top? Can it get any better than that? Pure love for this one! 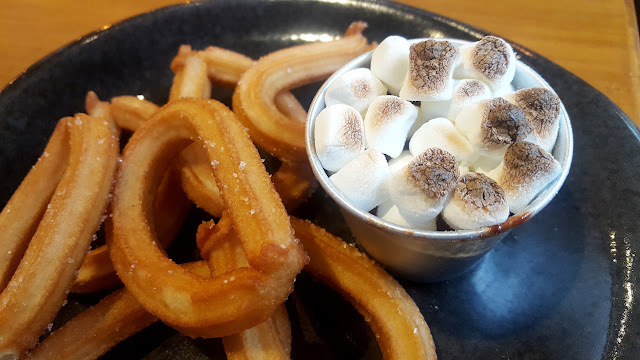 Churros S’mores – churro twists toasted marshmallow and chocolate dip. This dessert for me is very unique because of substituting the usual graham crackers with churros for your smores. The churros were good, but I must give the credit to the chocolate and the melted marshmallows they were the ones that brought the house down. By the way, the dark chocolate used for the dip is from Malagos Chocolate of Davao which offer organic third wave cocoa/chocolate, so expect nothing but goodness. Strawberry Banana Colada - This is a very refreshing drink and will remind you of summer afternoons. It had the right sourness and sweetness to it. Blueberry Cheesecake Shake - Don't be fooled by the dull appearance and lack of color of this drink. Because once you sip it, you literally be drinking blueberry cheesecake. Yeah, this is literally blueberry cheese cake in a glass! It is sweet, yes, but definitely not over-satiating. The kids will definitely love this, so are the kids-at-heart. House Brewed Coffee - just your good old fashioned house blend coffee. Ask for a creamer or pour milk on it and it's already a reason to celebrate. If you have noticed, the menu items have a touch of Asian flavors in them. 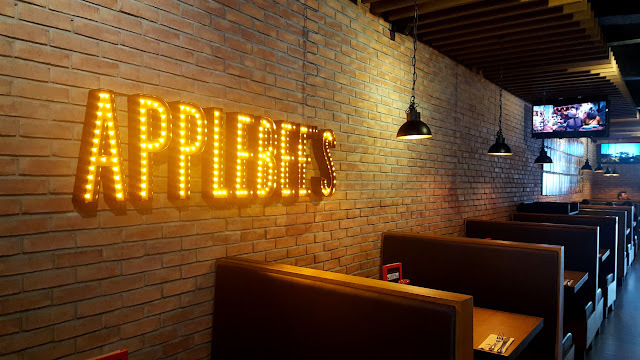 Like what I said earlier, Applebee's Philippines made some changes in their dishes to appeal to the Filipino and Asian palate yet still retaining the good old Southern American/Mexican flavors of their original dishes. Man, there's so a lot more in their menu that I still have to try. Since I live like a stone's throw away from Eastwood, I would most definitely go back! I think this is gonna be my go-to restaurant when I am in Eastwood. I love that it that I finally was able to cross out one of my dining bucket list without me going out of my country. It was honestly a wonderful experience! 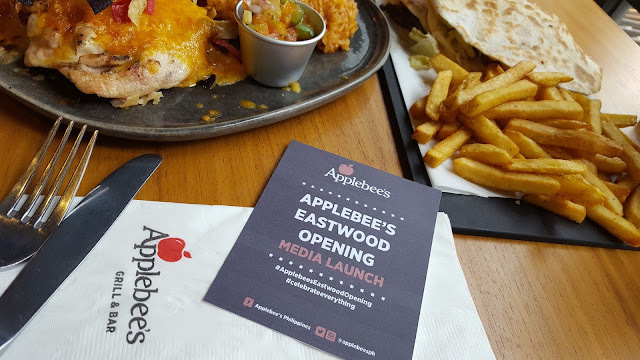 with that being said, I want to thank Applebee's Philippines, GRCI, and the GRCI Marketing (Sir Bob, Frances and Denise) for inviting us to the launch of Applebee's Eastwood branch and for making us feel at home. 'Til next time!